Condition Monitoring systems which work by means of the vibration diagnosis are able to detect smallest irregularities at drives of a wind turbine especially at the gearbox at an early stage. These irregularities can be for instance damages at rolling bearings and gears, imbalance and alignment errors. That way the operator of a wind turbine gets information on the condition which helps to plan the maintenance work, reduce costs and saves him from unplanned shutdowns. 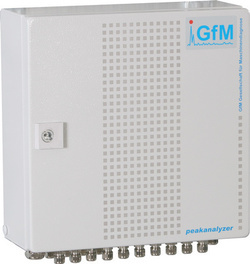 The Peakanalyzer by GfM was especially developed for industrial drives. It works largely automatically and needs only a relatively low maintenance support. The connection of up to 16 accelerometers and one speed sensor is possible. The power, the wind speed as well as further parameters can be collected as a reference or control factor. Great importance was set on a high signal quality because this is the requirement for a legally airtight diagnosis statement. The vibration signal is collected with 50 kHz per channel at a 16 bit amplitude resolution and spectra are created with 16,384 lines. The order analysis per resampling is consistently used in the field of wind turbine generators. Firstly, the analysis of spectra occurs automatically by means of the DVS-analysis (Drive Vibration Significance). If significant spectral components are detected which are in line to a damage according to their kinematical specimen, an alarm is triggered and the data is stored. Only then the adviser of the system comes into operation and checks and verifies the logbook entries. The DVS-analysis works largely independent of the power of the wind turbine generator because it is searched for significant spectral parts independent from their amplitude. The Peakanalyzer does not need a learning phase and can fulfil its function immediately after installation. The Peakanalyzer is certified by the Allianz Versicherungs AG for the operation in wind turbine generators.